Do you know some of your daily habits that can Damage your Brain? 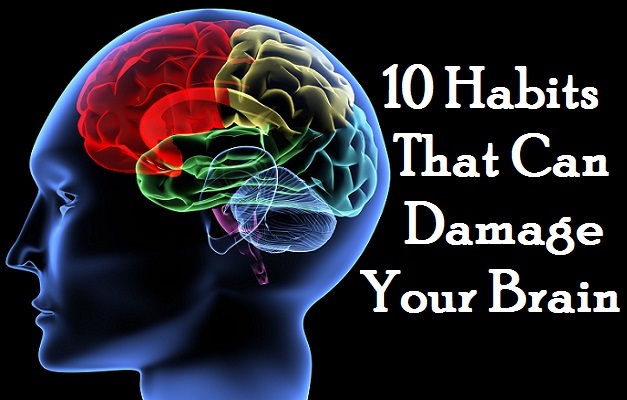 Yes, these simple 10 daily habits are damaging your brain. The human brain is one of the most important parts of the human body. Human Brain is like the CPU that helps us think and do our daily tasks and brain also take care of all the organs and assigns them work to do. So being the most delicate part of our body we must take care of it. To stay healthy and fit you must take care not to damage the brain by any ways. Damaged brain can lead to a number of health complications in our whole body. The World Health Organization has recently released a list according to their research, the Top 10 daily habits that can damage your Brain. Specially youngsters and girls avoid Breakfast either to diet or their not so busy schedules doesn’t give them much time to have their breakfast. After 8 hours of sleep your body needs sufficient nutrients. People who do not take breakfast or skip their very first meal of the morning, usually get a low blood sugar level which is not good for your health. This results in less supply of nutrients to the brain, which can cause brain degeneration. Skipping meals means no carbohydrates, which leads to less energy which you need for all your day. When you have your favorite dish in front of you, more seems less. You enjoy eating so much that you forget that your stomach is actually full. That generally happens, but do you know overeatingcan harden the brain arteries. And Hardening of brain arteries results in decrease of mental power. We all know smoking is injurious to health, especially the lungs. But few people know that Nicotine present in Cigarettes can cause multiple brain shrinkage. If brain shrinkage continues for a longer period, it may lead to Alzheimer’s disease. Some people have a sweet tooth and love to eat sweets and consume way too much sugar. If you like eating sweets then Stop. Consuming too much sugar interrupts in the absorption of proteins and nutrients. This results in malnutrition, which interferes with the development of the brain. Make sure kids are not involved in too much chocolate, sweets and sugary stuff. Not exactly a habit, but the fact is it has become a compulsion to live in polluted air. The irony is our habits themselves are the reason of Air Pollution. We all know that the brain needs oxygen to work and make our body work. Inhaling polluted air results in less supply of oxygen to the brain. Less oxygen means decreased efficiency of the brain. Sleep is very important for our body’s overall health and mental fitness. Proper Sleep for 8 hours means rest for all our vital organs and Brain. Sleeping late nights and sleep deprivation has become a trend of today’s youth, be it for work or friends. But long term sleep deprivation accelerates the death of brain cells. So if you don’t want your brain cells dead, get proper sleep. Many people love to sleep with the head covered. But do you know this habit of sleeping with head covered increases the intake of carbon dioxide and decrease intake of oxygen. As the carbon dioxide you release stays around you and fresh oxygen doesn’t get an easy way to reach you. This may lead to brain damaging effects, so if you sleep with your head covered, change the habit right now. This is very common with working people and students. Working hard or studying when you are sick is not good for your mental health. In weakness your body and mind both need rest. This may result in decreasing effectiveness of the brain as well as it can damage the brain. Not using your brain can cause Brain Shrinkage. Talking to yourself, thinking and debating is the best way to train our brain and stimulate thoughts. Thinking useful and healthy things are good for your mental health and thinking nonsense things is not advisable at all. People who are introvert and talk way too less are on higher risk of decreasing the efficiency of the brain. Intellectual and healthy conversations whereas to promote the efficiency of the brain. It is easier for you to improve the health of your brain now, when you know the 10 Daily habits that can damage your brain.